Patala-Loka, as we know, is home to Asuras (Daityas) & Nagas. However, where is Patala-Loka actually located? Many say that Patala-Loka is situated under the Earth's crust while others say it is not on Earth referring to the story of Hiranyaksha and Varaha where it is said that Hiranyaksha took the Earth in Patala-Loka. However, there is the Asuri tribe that is mainly found in Jharkhand, India; which claims to be the descendants of the Asuras. Where is the exact location of Patala-Loka? Well, there is another interesting parallel that can be drawn here. 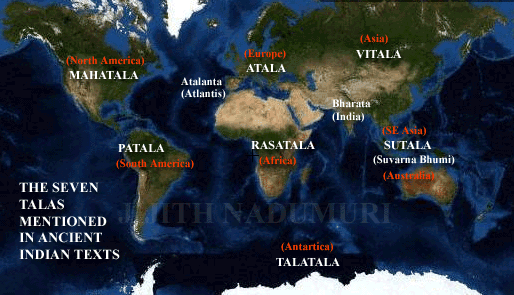 Instead of saying Patala is located downwards below the earth, we could say it is located at subatomic scales. Think, all those arguments still hold true and even more. We know that atoms are mostly empty space and shrouded in darkness. "when the sun sets in earth, it rises in patala"
It could refer to process of absorption of light. a lot of Nagas whose hoods are decorated with a jewel and thus enlighten this realm with the lights reflected from the jewels. This could be interpreted as atomic atom nuclei(nagas) with electrons(jewel) on there heads, which then also illuminate that realm with reflected light. There is no old age, no fret, no malady in Pataala Loka. Now all the matter visible to us ages and degenerates. Even higher scales like planets and stars age, but atoms don't. Everything that exists at atomic and subatomic or quantum scales neither degenerates nor ages in any manner. Also, the biggest reason that the geographical answer doesn't hold well is that knowledge of Vedas and other shastras transcends space and time. That is if you are standing in Central America or Mars, now or 5 million years later, it still must hold true. The closest it comes to is the modern physics. To that I would add that, the mighty and valuable Vedas can not be historical logs at the least. So, we must stop with that distorted interpretation. Thus the total diameter of the universe is approximately 500,000,000 yojanas, or 4,000,000,000 miles. Which is obviously wrong. Even Pluto is farther than that. This means we can not rely on yojanas to km conversion everywhere. There might be powers of 10 or similar used for appropriate scaling. In Atala there is a demon, the son of Maya Dānava named Bala, who created ninety-six kinds of mystic power. So, the grand total of natural elements is 94 or 98. Conclusion: Here, I am just pointing out the flaws, hints and possibilities. Cause we all will agree that present popular interpretations are very much forced and alot is amiss. Pataala-Loka: The lowest territory of the materialistic universe is called Patala or Nagaloka. Vasuki is the ruler of this Naga region. Here live quite a lot of Nagas whose hoods are decorated with a jewel and thus enlighten this realm with the lights reflected from the jewels. Vedic mythology, Pataala-Loka also seems to be very much a real place that has been stylized in various ways- located under the sea, located beneath the earth like so many stories we have. So Pataala-Loka may be located on the other side of the earth. "when the sun sets in the earth, it rises in Pataala" which is a clear indication that it is on the other side of the globe (Somewhere in South America may be Mexico/Belize). According to Vishnu Purana the divine itinerant sage Narada once visited Pataala Loka. Narada expresses Pataala more attractive than Svarga (paradise). Pataala is depicted as overflowing with luxurious jewels, striking orchards and lakes and appealing demon maidens. Charming fragrance all in the air merged with sweet music. Srimad Bhagavat Geeta also describes this region as more affluent than the upper regions of the universe, including heaven. Here in the Pataala Loka life is full of joy, riches, and comfort. There are constructions including palaces, temples, houses, yards, and hotels for foreigners embellished with jewels which are made by demon architect Maya. Though there is no sunlight available in Pataala Loka it is always enlightened with the lights reflected from the jewelry worn by the Pataala dwellers. There is no old age, no fret, no malady in Pataala Loka. The term Pataal-Lok slowly began to be applied to lands outside India. The Vedas which predate the Puranas hardly mention the Pataala-Loka, but do mention certain foreign tribes like the Nagas. The Puranas which came later, describe the Pataal-Lok in greater detail and make foreign tribes a part of it. Considering the opulence of these foreign lands, these lands could very well be outside India. Belize in Central America is believed to also have been inhabited by descendants of Bali who are said to have come from Belize in Angola. Yucatan territory in Mexico is believed to have taken its name from the Yakshas, who were residents of Pataala. Not the answer you're looking for? Browse other questions tagged asuras lokas earth . What is the Loka higher than Brahmaloka, where the Rathantara hymn is sung?